The first centre of its kind has been opened in the United Kingdom, combining commercial egg production with research and education. The Northern Poultry Campus has been established by Vencomatic near Helperby, York in North Yorkshire. It comprises four 16,000-bird free range houses, which will be operated by Wot-A-Hen, producing eggs for Noble Foods' happy egg brand, but it will also be used by leading universities for research into egg production and it will also help to educate and train egg industry professionals of the future. "It really is an exiting time. 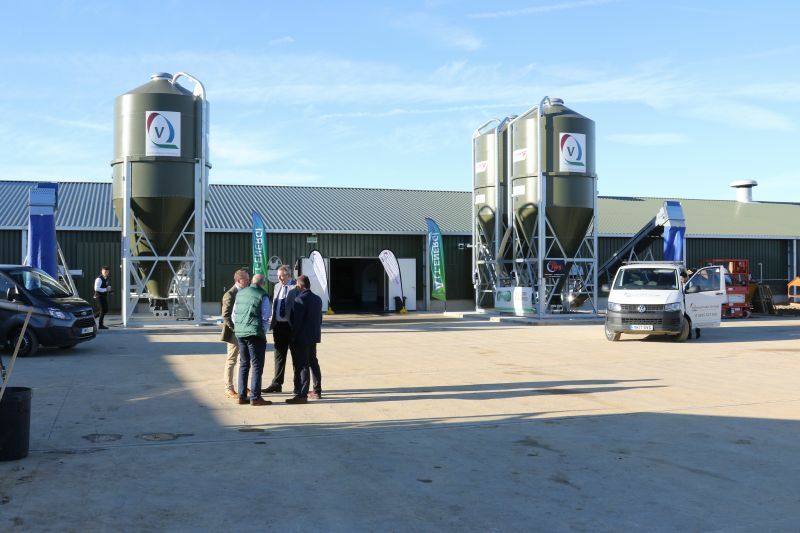 I honestly think that this is the poultry farm for the future," said Leon Furlong of Vencomatic UK during an open day held to enable people in the egg industry to look around the new facilities. Vencomatic says the Northern Poultry Campus will provide the highest standards of bird welfare in the world and also low antibiotic use. It says it offers a unique world research centre endorsed by leading academics in the field, an educational facility where Askham Bryan college will run a poultry apprenticeship scheme and - for the first time in the UK - a visitor centre, enabling members of the public to see how eggs are produced. Gary Ford, the NFU's chief poultry adviser, who was at the open day, said he was particularly impressed by the educational connections of the new centre. "What is particularly good is that the educational centre will be working in collaboration with Askham Bryan. We have got to encourage young people into the industry," said Mr Ford. "This educational tie-up is very interesting, very exciting. We need to show young people that they can have a good career in this industry - a career with good prospects and one that is well paid, which is unlike the perception of our industry." Vencomatic says the units on the farm will feature its Veranda Gallery nest, which it says has been designed for the highest standards of welfare following four years of research with the University of Bristol. It says its ethos is to create a series of highly efficient, high welfare free range poultry units, which are located in an environmentally friendly setting of 600 acres of trees and wildflower meadows. The litter and sileage from the range will feed a local anaerobic digester. Ground source heat pumps will provide even temperatures for the birds for efficient egg production. The farm will be a facility for the UK poultry industry, a template for modern egg production and is the future of high poultry welfare, says the company. Cor van der Ven, the owner of Vencomatic, told those attending the open day: "Vencomatic is a family company and what you see with Vencomatic is innovation." He said, "Every two years we have a new product." "Also important is that we never, never, never made a cage system. From the beginning we had a lot of discussion with the cage people." He said that when he first went to the United States in 1988 he had a video about free range birds but he was not allowed to show it. Now people accepted alternative production systems. Talking about the new centre in Yorkshire, he said: "I think the strong point of this is if we build more of these types of farms we do the research here. It's also a campus. I think that is very unique for the UK. It means that, together with the university, we can improve things." He said that small improvements made at the Northern Poultry Campus could be implemented on other farms. "I think it's a very good thing that we have the first poultry campus in the UK." He said: "It's great for the UK, it's great for Vencomatic and I see a lot of possibilities for the market in the UK." The open day was also attended by Adam Henson, who co-presents the BBC programme, Country File. He said: "What we see here today is extraordinary investment but very, very carefully placed. If you talk to an olympian about how to win a gold medal, it's about all those little tiny increments. "It's about the tiny little things they do that make them the best," he said. "That's what we have to do today in agriculture." Vencomatic says that the new centre will prove very important in the approach to 2025, the deadline that most major retailers in the UK have set for going cage-free. Whilst the British Free Range Egg Producers Association (BFREPA) says that the industry already has enough free range units to meet the needs of 2025, Vencomatic says that an extra 1,500 free range farms may be needed over the next few years. "Approximately 18 million birds are still in cages, which produce eggs much more cheaply than free range," said the company in a briefing about the new centre. "As the UK farming base moves toward free range, there needs to be a commercial and accurate assessment of how to do this. Free range egg needs to be produced with high welfare and as economically as possible." It said: "With the shift from cage, there is a requirement for more free range farms. UK egg consumption is also rising by 4.4 per cent a year. Most poultry farms are 16,000-bird units. The UK may need another 1,500 plus poultry farms over the next eight years." It said that, with 1,500 new laying farms and 500 new rearing farms needed, there would be a need for skilled farm workers. Most agricultural colleges had excellent provision for beef, dairy and sheep but very little for poultry.